Although aquarists often assume that research has been done on all types of marine animals, in reality the body of information about most of these creatures is vanishingly small. This is particularly true of coral reef animals, about which what is not known far outweighs what is. While coral reefs have been known as long as someone has been around to fish on them, scientific research on them has been a very recent endeavor, indeed. The first ecological research on coral reefs was done in the 1920's but, strange as it may seem, very little additional work was done over the next 30 or so years. Research on Caribbean coral reefs really didn't start until the late 1950s, and as recently as the 1970's the number of people actually out in the field doing scientific investigations would not fill a small meeting room. The reasons for this lack of research revolve primarily around logistics, expenses and the development of equipment. In general, the ecological sciences developed in England, the United States, Canada and the northern European countries. Coral reefs are distant from these countries, expensive to visit and relatively difficult to study. For reasonable ecological research to occur, the investigator needs to be on the site for extended periods. Shallow water marine environments of all sorts had to await the development of some sort of equipment to allow the researcher to be on location for extended periods. The necessary equipment in this case was SCUBA (an acronym for Self-Contained Underwater Breathing Apparatus). It wasn't until the late 1960's that a few scientists began using scuba as a research tool. Even then, because of the expense in getting to them, coral reef areas were not extensively studied. Underwater research is difficult in a number of regards. Non-divers do not seem to comprehend the problems inherent in moving in a viscous medium where visibility is severely limited even at the best of times and where currents and surge can make even taking notes difficult. Additionally, because of the necessity of breathing pressurized air, and of being under high pressure, the time on site is very limited. In essence, the dollars per datum ratio is very high; or, put another way, an underwater researcher doesn't get much bang for the buck. Most in-depth ecological research is done by graduate students as part of their, primarily, doctoral research programs. Such programs are often designed to last several years and provide a significant body of information. Due to the nature of funding agencies, however, such studies are often run on shoestring budgets. The bottom line is that 1) it has been very difficult for decent long-term underwater water ecological research of any sort to occur, and 2) when good projects are carried out, they are generally done in close proximity to a marine laboratory. Most marine labs are in temperate regions distant from coral reefs, and this is where most marine ecological research occurs. The result is that until, say, the last 15 years or so, most ecological research carried out on coral reefs was of the nature of short-term projects and even relatively little of those were done. That result leads inescapably to the real bottom line which is: we don't really know diddly about most coral reef animals. The term "life history" is a misnomer. What the term really means is the generalized "story" of an average individual's life. Probably the animal whose life history is best known is the human. Broken down by geographical region and other demographics, it is possible to predict with surprising accuracy the life span, as well as the major life experiences, such as the number of offspring, and when they occur, of the average individual of many human populations. In the case of humans, the driving force for the accumulation of such knowledge is not the desire for "abstract knowledge," but rather the desire to make a profit. On such knowledge is the insurance industry built, and it is based to a great extent on studies of human life history profiles extended to the greatest precision possible. We also know the life histories of a large number of other, mostly terrestrial, organisms. In these cases, biologists have spent a great deal of time studying these animals' populations and have noted when the animals are born, when they die, how long they live, when they mate and so on. All of these data can be massaged and manipulated statistically to provide a good understanding of the essential experiences of an average member of those species. However, once we move out of the terrestrial realm and into the oceanic environment, our ability to see all of the relevant aspects of any given organism's life is significantly obscured by a wall of water. Nonetheless, biologists do know many aspects of a great many marine animals' life histories; the majority of what has been written, however, comes from investigations of animals undertaken from temperate areas. By and large, when biologists discuss the life histories of most tropical marine animals, they wave their arms and generalize a lot. In essence what they do is take what is known about similar temperate species, "rub a little biological 'funk' on it" and warble a prognostication about what they think will happen or what is happening in the tropical environment. Depending upon the organism in question, the frequency of the arm waving may generate quite a nice hum. What it doesn't do, however, is actually describe what is occurring with regard to the tropical organism being discussed. That doesn't take arm waving or prognostication. It takes good, down to earth (or ocean bottom), tedious, long-term, expensive and dedicated research. Frankly, very little of that has been done on any tropical species - and it has been completed for precious few temperate ones. In this article I summarize the results of a series of research projects concerning a temperate octocoral, the sea pen, Ptilosarcus gurneyi. This species has also been known as Ptilosarcus quadrangulare, Leioptilus quadrangulare, Leioptilus guerneyi and Ptilosarcus quadrangularis, but these names have long been considered to be junior synonyms. Nonetheless, they still turn up from time to time, particularly in comments on the internet. The basic research on which this article is based was reported in two papers (Chia and Crawford, 1973; Birkeland, 1974), but in addition, there is a significant amount of my own hitherto unpublished research. For ease of readability, I will not cite either reference again. If the reader is interested in more detail, please read these articles or contact me directly. In total, this information represents several thousand person-hours of observational time. As far as I know, no similar body of knowledge exists for any tropical octocoral. I hope, however, that this example will elicit some appreciation for the life history of at least one type of coral, and also perhaps the types of data that are needed to be able to cogently discuss these animals. Figure 1. A mature Ptilosarcus gurneyi individual extended about 50 cm out of the sediment. The primary polyp consists of the base extending into the sediment, and the rachis or stalk extending up between the "leaves." The gastrozooids or feeding polyps are found on the outside edges of the leaves, and the siphonozooids or pumping polyps are found in the orange regions on the sides of the rachis. The "warts" on the leaves are caused by a parasitic isopod living inside the pen's tissues. Figure 2. 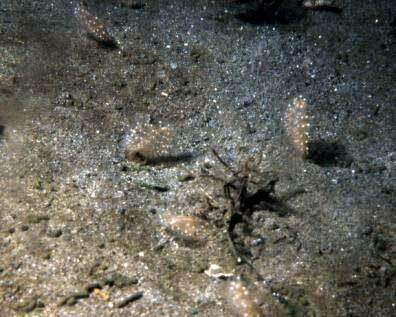 A portion of a sea pen bed in the central Puget Sound region; the depth was about 15 m. Water flow was from the left, and the foreground field of view is about one meter (3.3 feet) across. 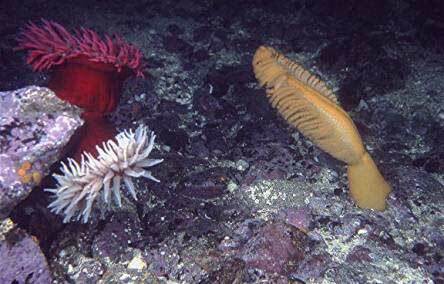 Sea pens are octocorals. 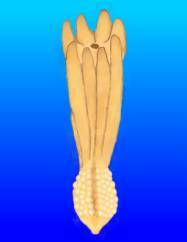 Taxonomically, they are placed in the Order Pennatulacea of the Subclass Octocorallia (= Alcyonaria), in the Class Anthozoa of the Phylum Cnidaria. All of this jargon means they are animals whose major body parts consist of modified polyps. All are sessile, living in unconsolidated ocean bottom sediments. They are not fastened to the substrate and at least some sea pens are capable of significant locomotion. Being octocorallians, they have polyps that show an octamerous or eight-fold symmetry. The most obvious manifestation of this symmetry is the presence of eight tentacles around the mouth of the feeding polyps, or gastrozooids. These tentacles each have small side branches, a condition referred to as "pinnate branching." 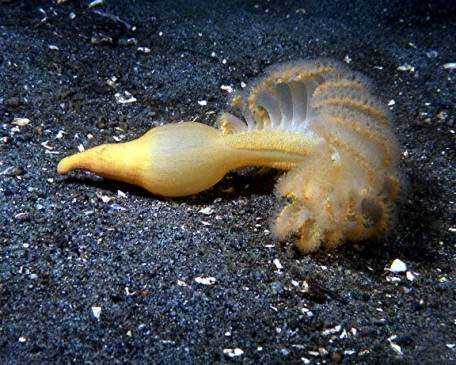 The adult sea pen's body is considered to be comprised of modifications of three types of polyps. 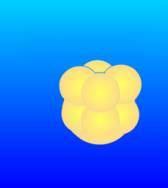 The base and central stalk region, or rachis, is considered to be the modified original polyp. 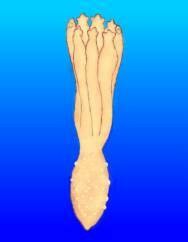 The gastrozooids are found either on the surface of the rachis, or on lateral extensions from the rachis. Depending on the species and its adult size, there may be from about ten to many thousand gastrozooids. 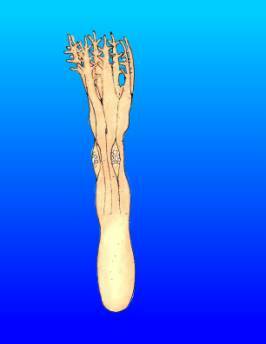 Embedded in the rachis' surface are the siphonozooids, which are modified polyps lacking tentacles. These structures consist of a "mouth" which is lined with microscopic, beating, hair-like projections called "cilia." Siphonozooids pump water into the colony's body. The colony has quite an intricate system of channels that allow the movement of water and nutrients throughout the body. The force necessary for water movement comes from muscular contraction of the body and the beating of the cilia lining the water channels. Figure 3. 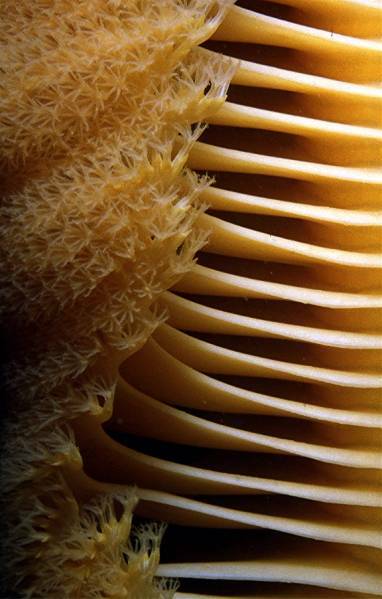 The edges of a mature sea pen's leaves, showing their numerous gastrozooids. The leaves are oriented into the current, and can generate hydrodynamic lift. When the animals are disturbed, they may orient into the current, inflate, climb out of the sediment and drift away in the current. Figure 4. 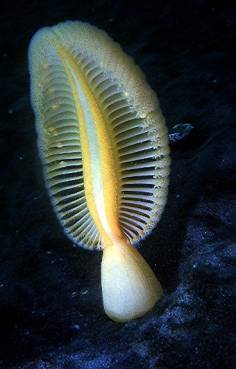 A photograph of a sea pen's rachis, showing the siphonozooid region. Siphonozooids are basically polyps without tentacles that pump water into the pen. Note the small stenothoid amphipod found on the pen's surface. These harmless animals are related to some of the minute amphipods that are sometimes found on aquarium corals. 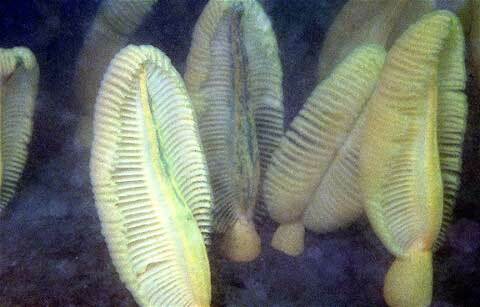 Sea pens are like the late comic, Rodney Dangerfield, in that they "don't get no respect." They are often largely ignored in invertebrate zoology classes, and hardly discussed at all in many marine biology classes. Nonetheless, they are surprisingly abundant and, in fact, may be the dominant cnidarians over most of the earth's surface in areas where stony corals, other octocorals and most sea anemones are essentially absent - the deep sea abyssal plain. This is Earth's largest ecosystem and much of it is characterized by the presence of vast fields of sea pens. I doubt anyone has made the calculations, but I suspect that it would be a sure bet to say that the biomass of sea pen living tissue exceeds that of all other benthic cnidarians combined. Ptilosarcus gurneyi (Gray, 1860), the subject of this article, is found throughout the Northeastern Pacific from Alaska to Southern California. Fully-expanded, large, adult individuals may extend for about 60 cm (2 feet) out of the sediments, with their base extending into the sediments another 15 to 30 cm (6 to 12 inches). Fully contracted, these same large adults will be about 15 to 20 cm (6 to 8 inches) long. Their body's color ranges from a pale cream to a deep orange-red. Their body's morphology may bring to mind a fat, carrot-colored quill pen. Internally, they contain a single large calcareous and proteinaceous object called a style. 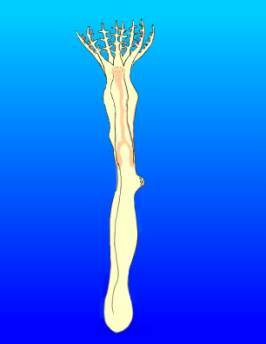 The style's size is related to the sea pen's age and may be used to obtain ages of individuals in a population. 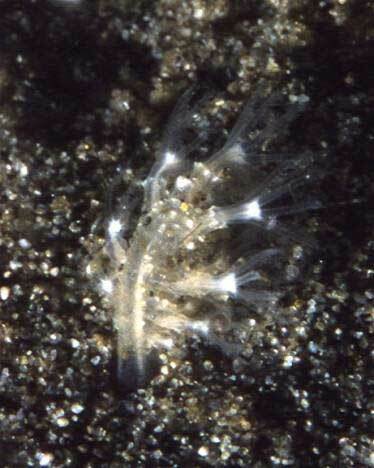 Ptilosarcus gurneyi are found in shallow waters, ranging from the lowest intertidal zone to depths of about 500 feet, but are most abundant in shallow waters. And, they may be amazingly abundant. 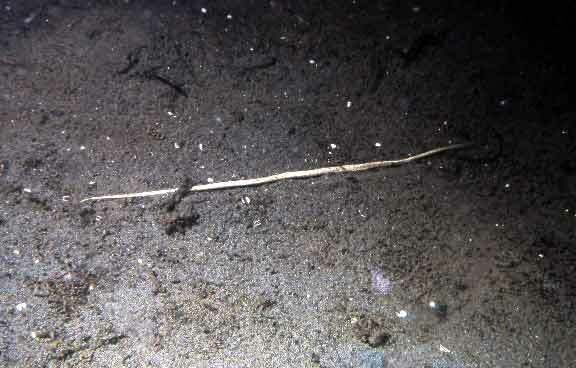 In the Puget Sound areas studied by Birkeland, the number of sea pens averaged up to about 23 pens per square meter, with an average of about 8 of these being three years old or older. These sea pen beds typically range to depths in excess of 50 m, and extend laterally for dozens of kilometers, interrupted only by physical features such as scouring river currents, dredged harbors and the like. Although these beds are discontinuous, because of the area's currents they are not isolated from adjacent beds. Larvae are dispersed throughout the region, and even adult pens may move great distances. The adults can crawl up out of the sediment, inflate with water and drift along in the currents, much like an underwater balloon. Figure 6. A sea pen photographed in the field a day or two prior to spawning. Note the eggs in the bodies of the gastrozooids. The extended nature of the gastrozooids is visible in the image. Their guts extend through the leaves into the rachis where they meet and fuse with a large internal canal system that extends throughout the animal. The eggs are about 0.600 mm in diameter. The sea pens have a cyclic behavioral pattern during which they inflate, feed and then deflate. They may do this several times a day, and the rhythm appears more-or-less unrelated to feeding or available foods. Birkeland found that at any one time, only about 26% of the pens were exposed, with the rest being buried in the sediments. They completely bury into the sediments, often to a depth of 30 cm (1 foot) or more. The sea pens totally dominate and structure these communities. 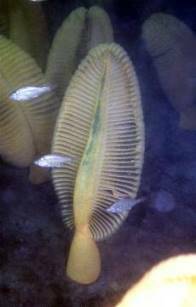 Very few other macroscopic animals live in the sediments of sea pen beds, possibly due to the continuous bioturbation resulting from the sea pen's movement. As might be expected, the sheer mass of sea pen flesh in these areas is a resource that has not "gone unnoticed" by predators. In fact, an amazing variety of predators have become adapted and, in some cases, totally dependent upon the sea pens. In many respects, Ptilosarcus gurneyi in sea pen beds fill an ecological position similar to the huge herds of bison that used to occupy the American Great Plains, or to the grazing animals of the Serengeti. In each of these cases, whole food webs were built upon the basic keystone resource species. Sea pens are suspension-feeding animals. They feed on small organic particulate material, larvae and other small zooplankton. In turn, they are fed upon by a wide variety of benthic predators. 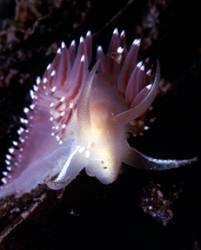 When they are small, they are eaten by several species of nudibranchs. 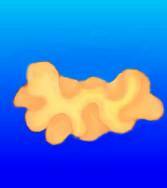 As they grow, they become too large for the smaller of the nudibranchs, although other larger ones may still eat them. As the pens get larger, however, they become prey for several species of sea stars. 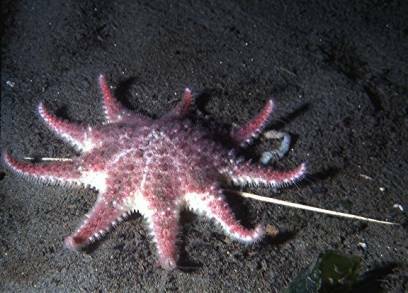 The top predator in the system is yet another sea star, which preys on those stars. Figure 7. Evidence of incomplete or attempted predation; in both cases these partially eaten sea pens probably were attacked by nudibranchs. These nudibranchs primarily eat the smallest pens and become common in sea pen beds shortly after the juveniles settle and metamorphose out of the plankton. Left: Phidiana crassicornis. 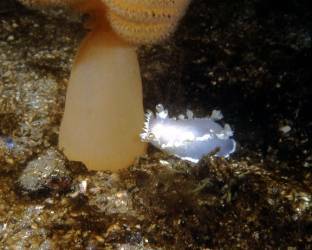 Right: Flabellina fusca. 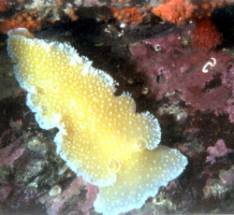 Both nudibranchs are small, reaching lengths that do not exceed about 4 cm (1.6 inches). These species are responsible for the deaths, on average, of upwards of 200 sea pens per square meter, per year. 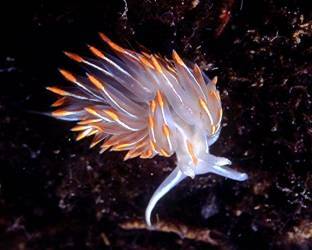 This nudibranch, Tritonia festiva, reaches lengths of about 10 cm (4 inches) and primarily eats small to medium-sized sea pens, but will not hesitate to take a chunk out of a larger one, as the above individual is about to do. 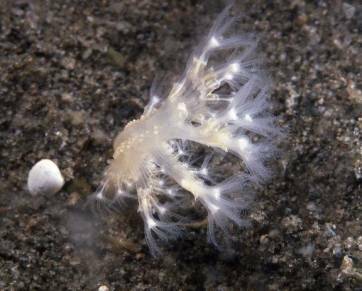 See this slide show of a large nudibranch eating a juvenile sea pen. 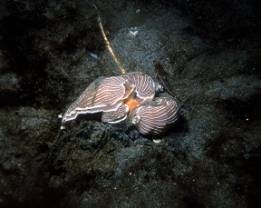 These two large nudibranchs, Tritonia diomedia (left) reaching lengths of 15 cm (6 inches) and Tokuina tetraquetra (right) reaching lengths in excess of 30 cm (12 inches), also eat sea pens. 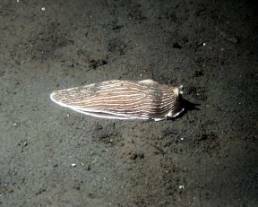 Although Tritonia is common in sea pen beds, Tokuina is not, and tends to eat isolated sea pens growing in sediment pockets in rocks. 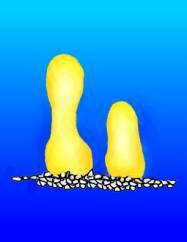 These nudibranchs can eat the largest sea pens without any difficulty whatsoever. These images show Armina californica (left), probably the most abundant nudibranch predator that eats Ptilosarcus. Although capable of eating a pen alone, these animals seem to be gregarious feeders and are more often seen clustered over the remains of their prey (right). These nudibranchs can reach lengths of about 10 cm (4 inches) long, and will eat all sizes of pens. 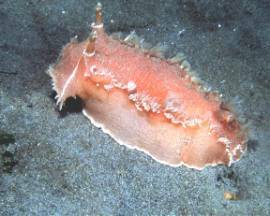 In the areas of the sea pen beds, about 50% of the food items eaten by the rosy sunstar, Crossaster papposus, are sea pens. 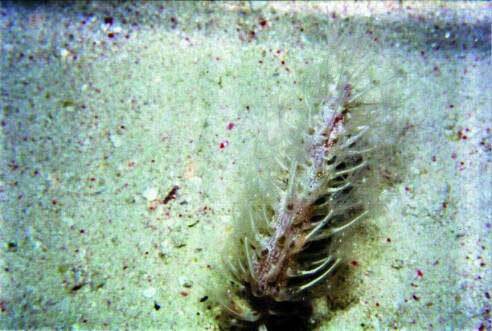 In the areas of the sea pen beds, about 98% of the food items eaten by the leather star, Dermasterias imbricate, are sea pens. 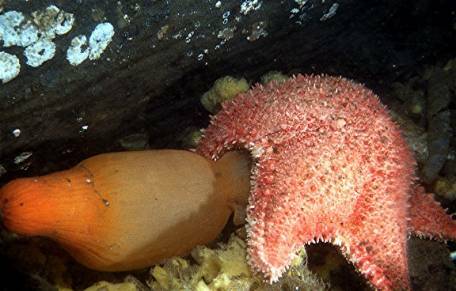 The vermilion sea star, Mediaster aequalis, is a predator of sea pens, among other things. 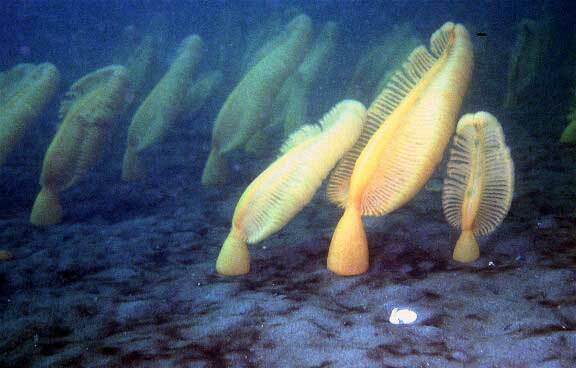 About 38% of its diet in sea pen beds consists of the pens. Here a sea star is hanging on to a pen that is expanding and trying to dislodge it. Pens bury into the sediments, and if stimulated the pen will sometimes inflate, expand and attempt to dislodge the predator. Note that the pen has lifted the sea star totally off the substrate. 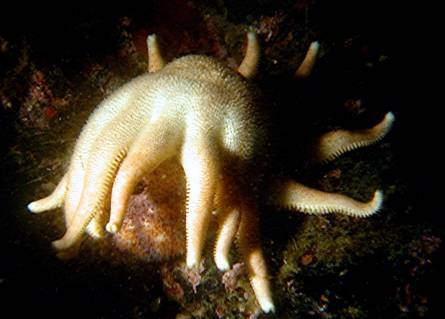 The spiny sea star, Hippasteria spinosa, eats only sea pens. 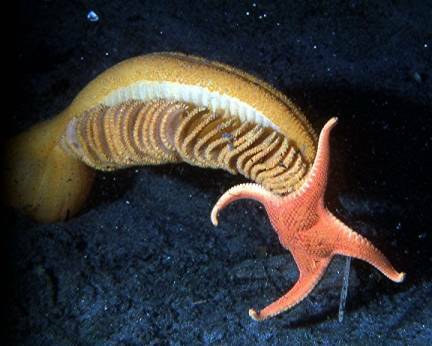 It takes a full-grown star about four to five days to eat a fully-grown sea pen. 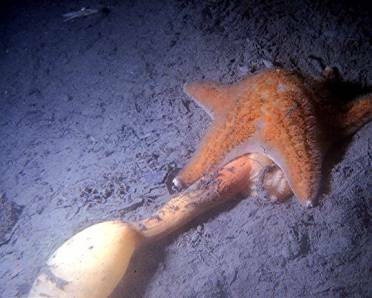 The "top dog" in these ecosystems is the morning sun star, Solaster dawsoni, here shown eating a Stimpson's sun star, Solaster stimpsoni, which it has in a literal death grip. Although relatively rare in the sea pen beds, the morning sun stars can and will eat all other sea stars that they come across. As nothing eats them, they are the top predators in the system. The end result of all the predators' effects is the style. In the first week following the spring equinox, Ptilosarcus gurneyi generally spawns. In the laboratory during that time, sunlight hitting a tank of gravid sea pens that have been shaded will induce spawning. 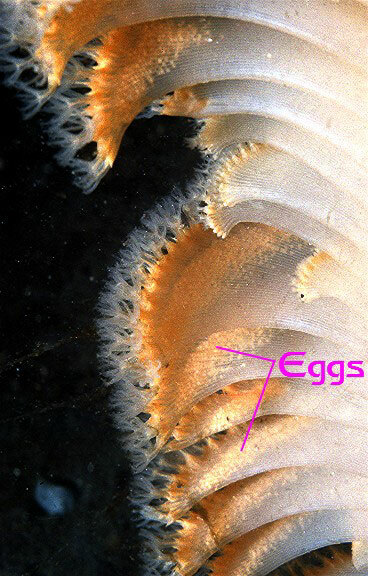 The eggs are large, about 600 µm across, and a mature female colony will produce upwards of 200,000 of them. 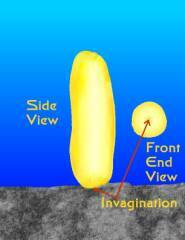 Fertilization occurs in the water column. Embryonic development occurs over about three days at 12º C, and results in a football shaped mobile, but non-feeding (lecithotrophic), planula larva about 1 mm long. The planulae begin to swim to the bottom of containers and, by inference, to the ocean's bottom by the time the larvae are about five days old. They touch their anterior end to the sediments, and if the sediments are coarse sand, with particle sizes in the 0.250 to 0.500 µm range, they settle into that sediment and begin to metamorphose into small sea pens. If appropriate sediments are not available, settlement and metamorphosis may be delayed for as much as a month. These pens are found in areas dominated by vigorous tidal flows and offshore currents. In a month, the larvae could disperse over great distances. Figure 18. All of the drawings in this article were done from living embryos and larvae of developing Ptilosarcus gurneyi. Left: The newly released ovum. Center: Embryo at about the beginning of the 4-celled stage; about four hours old. 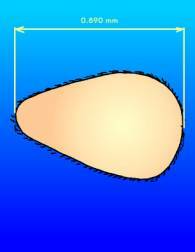 Cleavage is superficial and doesn't extend through the embryo. Right: Embryo between the 4- and 8-celled stages, about six hours after fertilization. Figure 19. Ptilosarcus gurneyi. Left: The 8-celled stage, about the same diameter as a newly spawned egg; about seven hours after fertilization. Center: Embryo at the 16-celled stage; about eight hours old. Right: Embryo at the blastula stage, about twelve hours old. Figure 20. Ptilosarcus gurneyi. Gastrula stages; individual cells no longer visible. Left: Early gastrula, irregularly shaped, about 24 hours old. Center: Gastrula, about 36 hours old. 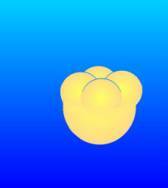 Right: Late Gastrula, the embryo has become ciliated and is swimming; two days old. Figure 21. Ptilosarcus gurneyi. Left: Early planula, about three days old. Right: Planula larva at four days old. Figure 23. Ptilosarcus gurneyi. Left: Planula at five days. 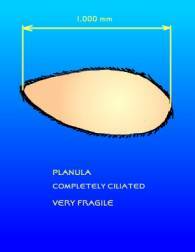 Center: Planula, settling, about six days. 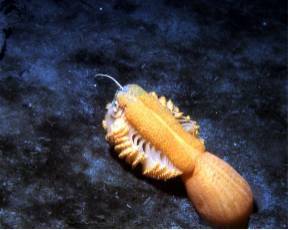 Right: Settled larva undergoing metamorphosis into a juvenile sea pen, about eight days of age. The animal is capable of contraction and elongation. Once metamorphosis begins, development into a feeding individual is rapid, with the first polyp having functional tentacles within two weeks of spawning. Active feeding begins soon thereafter and growth may be relatively rapid. Once the sea pens have settled, they become potential prey for many predators, and this predation pressure is extreme. Small sea pens are eaten at the rate of about 200 per year per square meter by small nudibranchs. If they can survive this period, they become large enough to avoid becoming prey for the smallest of the nudibranchs, but they become food for sea stars. Sea pens grow at a relatively constant rate, reaching sexual maturity when they are about 24 cm (9. 4 inches) tall and five years old. Both growth and predation rates are steady; there is no cessation of growth upon reaching an "adult size." As with many cnidarians, there is no old age or senescence demonstrable in these animals. Nonetheless, they don't live forever. In essence, their life is an exercise in "beating the odds," and as in all such cases, the "odds" in this case, the odds of being eaten by a predator, are too great for indefinite success. The life expectancy of an individual sea pen in the Puget Sound areas appears to be about 14 to 15 years. Older animals may be found occasionally but, if so, they are very rare. Predators aren't the only source of mortality in sea pens, nor are sea pens immune from parasites, which may influence their growth and survival; however, these factors remain unstudied. Figure 24. Drawings, done from life, of a developing Ptilosarcus gurneyi. Larva undergoing metamorphosis. Left: 11 days old. Center: 13 days old; tentacles clearly evident; bumps on body's surface are of unknown function, spicules are not present; mouth is open and a gullet or gut is evident. Right: 15 days old; note the development of the tentacles' first pinnae. Figure 25. Drawings, done from life, of a developing Ptilosarcus gurneyi. Two individuals about three weeks old. Spicules are evident in the body's wall. 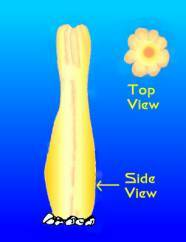 They have one complete feeding polyp, the primary polyp, and siphonozooids on the stalk. The animals were actively feeding at this time and were about 3.5 mm long. The extent of the visible gut is shown in the individual on the right. These individuals were settled and growing in coarse sand. At this point, I terminated this growth series and transplanted the juveniles to a sea pen bed in one of my research study sites. Figure 26. 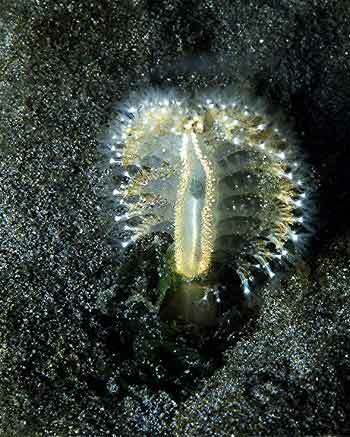 A juvenile sea pen, photographed in nature; depth about 15 m. The animal is about one year old. It was between one and two centimeters (about 0.4 to 0.8 inches) high. Note the gastrozooids, and the internal calcareous style (visible as a white band). Figure 27. A juvenile sea pen, photographed in nature; depth about 15 m. This animal is about two years old. It was about 5 centimeters (about 2 inches) high. Note the gastrozooids, the siphonozooids (visible as bumps on the stalk) and the developing leaves. Figure 28. 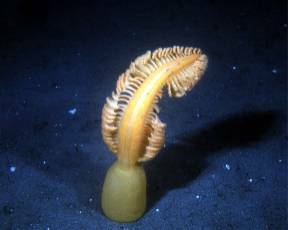 An older juvenile sea pen, probably about four years old, about 15 cm (6 inches) high. The internal style that can be used to determine the animal's age is clearly visible as a white internal stripe. Figure 29. The Green Disease. As if predation weren't enough, sea pens are subjected to other maladies as well. The green coloration in the pens above is caused by an endoparasitic green alga, which appears to kill the pens, albeit taking several years to do so. Figure 30. Not all Ptilsosarcus gurneyi in the Northeastern Pacific are found in dense beds. They may be found in many other habitats where sand pockets of the appropriate type occur. The anemones to the left are Urticina piscivora, and are about 30 cm (12 inches) across the oral disk. During their lifetime, these pens probably reproduce about ten times. If the average number of eggs produced by one pen is 200,000, then each female will produce about 2,000,000 eggs over her life span. If the populations are assumed to be constant, neither shrinking nor growing, then over the female's life span she must spawn only enough eggs to replace herself and her mate, indicating the odds of survival to successful reproduction by any given Ptilosarcus gurneyi individual in the Puget Sound region is about 1,000,000 to 1. Although those odds seem pretty slim, they are significantly greater than many other marine animals such as pelagic fishes. Figure 30. Juvenile Ptilosarcus settle in dense assemblages; they have to, to be able to withstand the predation pressure from the array of predators that feed upon them. Figure 30. Just to show they exist, here is an image of an unidentified tropical sea pen, probably a species of Veretillum, courtesy of Eric Borneman, taken at Karang Koromaha Atoll, Sulawesi. His description of taking the picture says all that is necessary about underwater research, "[The picture] is not the greatest, I was clutching onto the bottom in a raging current at night on an outgoing tide out of an atoll, and its not easy to take the perfect shot when rocks are literally tumbling by and sea cucumbers are rolling by and sand is making vortices on the bottom, but here it is. I was in this channel between large bommies, and there was nothing to grab onto where all the sea pens had unfurled; maybe 3m of water, and I kept trying to dig into the sand but just got blown away. Finally, I found a nub of rock sticking out of the sand, latched on, and took the shot with one hand." Although temperate sea pens are not likely to be an animal of choice for most reef aquarists, tropical sea pens of several genera are, at least, moderately commonly available to aquarists. For those interested in aquarium husbandry, some things may be taken to heart from my tale of sea pen life and, mostly, death. First, despite their apparent simplicity, these are hardy animals capable of surviving much environmental perturbation; unless eaten, they have the potential to live a long time. Second, they are mobile and capable of movement, and will leave areas that are not to their liking. In a marine aquarium, tropical sea pens will have to be provided with a deep sand bed - really deep - 30 cm (1 foot) or more - to allow their innate activity patterns to be expressed. Additionally, the appropriate physical habitat conditions such as current regimes, temperature and salinity must be matched to natural situations. Third, sea pens lack zooxanthellae, yet they have a rapid growth rate. Consequently, they need to be fed. They eat small zooplankton; organisms much larger than newly hatched Artemia are likely to be too large for them. They probably will not eat much phytoplankton unless it is added as a dead suspension of clumped cells. Fourth, sexual maturity is likely to be reached when the animals are significantly less than full-sized. 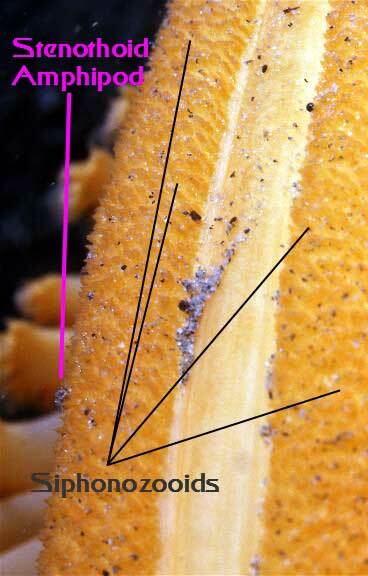 Eggs, at least, will be quite noticeable as they develop in the "leaves" below each gastrozooid. Sperm may be difficult to see, but may be noticeable in similar bodily regions as white patches. Given the number of eggs released by even a small individual, it is likely that spawning events would significantly foul a small aquarium. 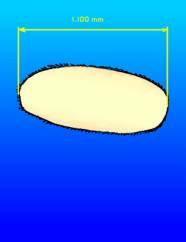 If eggs are seen developing in a "pet" sea pen, then the aquarist must plan for the upcoming blessed event. Finally, these are captivating and strikingly beautiful animals. Additionally, they show activity patterns totally lacking in the "colored sticks" kept by many aquarists. If the hobbyist is willing to accommodate their specific needs, primarily by providing a deep sand habitat for them to bury into, and an appropriate diet, they likely will thrive.